The dainty white flower clusters of Daucus carota or Queen Anne's Lace grace summer roadsides and fields throughout the U.S. Sometimes called wild carrot, this plant is not native, but is a European immigrant. Its delicate seed heads often last through out the winter. 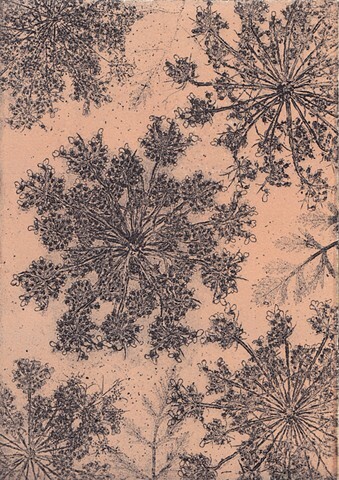 The flowers, seed heads, and leaves of this plant were used to prepare the copper etching plate for this print. A series of prints were made with different background colors including this one of burnt sienna.